Star spangled decor? Yes, please! 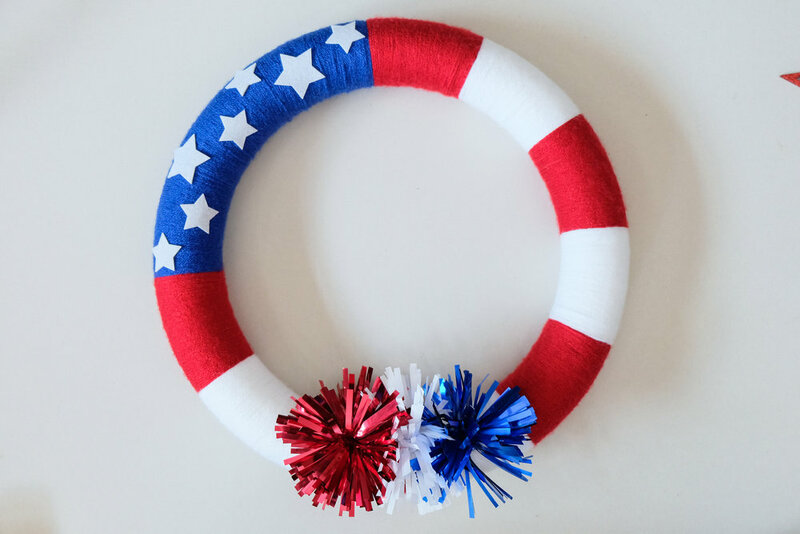 This DIY 4th of July yarn wreath includes several elements that are staples for every true crafter. Yarn, ribbon, felt and of course, glitter. What would we do without glitter? Have you ever looked at a project and thought, "it's almost finished. It just needs... something..."
Glitter is almost always the answer. 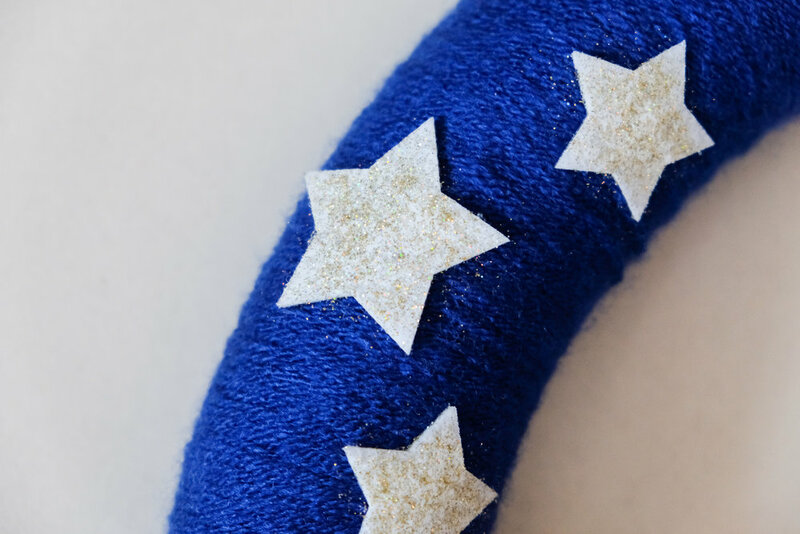 This DIY is super easy, although a bit time consuming. I got everything I needed at Hobby Lobby, but you can find the basics and whatever embellishments you like at any craft store. Red, white and blue yarn. You won't use much of each skein at all. Star shaped felt stickers - I expected to need hot glue with these, but they're actually quite sticky. Whatever embellishments you like - I got these cute little pom poms and star from the party section. One thing I like about this project, is you don't have to pre-measure or cut the yarn. Just pull out one end and tie it to your wreath at the 12 o'clock position. Leave about a 4 inch tail. This particular wreath form has notches on it, so that takes out the guess work for how far you need to wrap. On one side of the wreath form, the notches are a little wider apart and on the other side, a little closer. I used the side that had notches a bit closer together. Leaving the tail out, start wrapping the yarn around the wreath form in a clockwise direction. (Pictured is the back of the wreath, so it appears backwards) You can wrap the skein of yarn around and around several times, then adjust and condense the strands. You don't need to pull them very tight, just don't leave them loose and floppy. When you reach the next notch, cut the yarn, leaving a long enough tail as pictured below. Loop the tail of the yarn under the last strand you wrapped and pull it snug. That doesn't create a knot, but will keep it from unraveling while you start the next step. Tie on the white yarn and start wrapping around and over the red tail. You can see here, how wrapping over the tail of the previous color creates a fairly seamless transition. Even though it's on the back and no one will see it, my inner perfectionist just likes this method best. 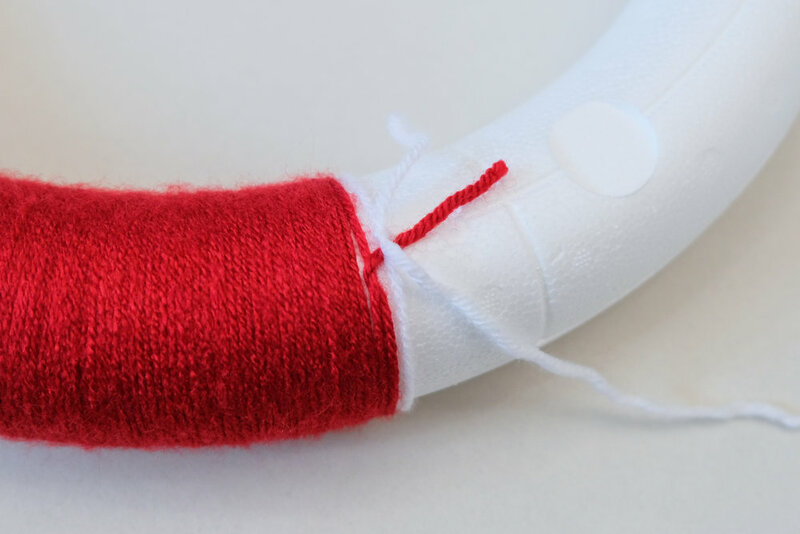 Keep wrapping and alternating red and white yarn. You should end at the 9 o'clock position with red yarn. You can check the finished product for reference. Wrap the remaining wreath form in blue yarn. When you get to about an inch and a half from the end of the wreath form, back around to the red yarn, lay the red tail out flat and wrap the blue yarn around it as you finish it. Cut the blue yarn, leaving about 4 inches to make it easy to work with. Tuck it under the previous strand as you've done with every color change, then do it one extra time to secure it a bit more. 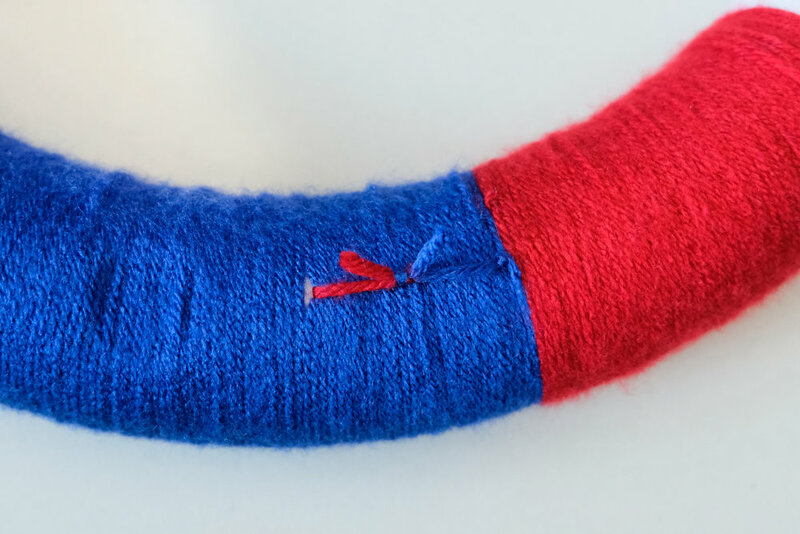 Tie the red and blue ends together, just don't pull them too tight or you'll separate the yarn. Trim the excess off so it won't hang down and show from behind. Congratulations! The tedious part is finished! Pic out the sizes of white felt stars you like and lay them out. When you are happy with the layout, peel the back of each star off and stick them on one at a time. If you're using the same embellishments, then snip off the wire at the base of each pom pom. I bought two stems. They each come with one red, white and blue pom pom on them. However, I only ended up using one of each color. Hot glue the pom poms along the bottom, like so. Next, poke the stem of the star down vertically through the middle of the wreath, all the way through. Stop when it's sticking up at the height you like. Push the star through just a little farther, so you have room to work and bend the end down toward the back. Try to round it out a bit to fit the form of the wreath. Squirt a nice thick line of hot glue under where the wire will go, and pull the star back out to snug the end of the wire down into the glue. Then, add a little more glue on top for good measure. Remember when I mentioned looking at a project and wanting to add something extra? I'm not sure how much this really added, but I lightly brushed on some Mod Podge and dabbed on some gold glitter. It's very fine and not very noticeable. If I'd had silver, that would have been better. For the finishing touch, cut off some ribbon and fold it in half. Place the loop behind the wreath and bring the two ends around the front and under the loop. Pull it tight. Then, depending on how you're hanging the wreath, tie the two ends in a knot at whatever height you need. You can cut off the excess or tie it in a cute bow. Whatever you like! Please subscribe so you don't miss out on the next one! Also, follow me on Facebook, Instagram and Pinterest to see the latest projects and what I'm up to.